In an age of over-sharing, business owners and leaders struggle with the line between too much information and a lack of transparency. 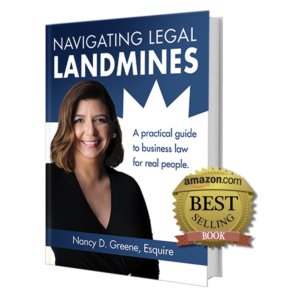 Negotiating these legal landmines is particularly difficult when because the dual needs between transparency and confidentiality conflict. Both the complaining employee and accused employee need to have the allegations kept as confidential as possible. While there’s generally no right of privacy in the workplace, a company needs to be sensitive to all parties’ feelings and reputation. Just because a complaint of discrimination is made doesn’t mean its true. But, it doesn’t mean it’s false either. The complaining witness hascome forward because he’s experienced something he believes is wrong. The complaining witness shouldn’t be subjected to further embarrassment by having the complaint disseminated across the workplace. The alleged harasser shouldn’t lose his reputation, created over years, just because a complaint is filed. But complete confidentiality can’t be assured. After all, the company needs to interview potential witnesses and certain people in the chain of command will need to know. Still, the company must do its best to limit the spread of information related to discrimination and harassment claims. Keeping the information as confidential as possible also protects the company from possible future liability. The company (and its management) can’t take retaliate or take “adverse job action” against a complaining employee because of the complaint. Adverse job actions includes obvious things like firing the employee, but it also can include transferring that employee to a less prestigious position. If the employee’s new supervisor doesn’t know the employee alleged her former supervisor sexually harassed her, the new supervisor can’t retaliate against that employee because of the complaint. One place the company needs to be more transparent is in the results of the discrimination investigation and any disciplinary action taken against the harasser. As an example, C-Red, Inc. received a harassment complaint from Sebastian that Moria, another employee, was sending her sexually explicit jokes. C-Red properly investigated and handled the complaint. Ultimately, C-Red determined that Moria and Sebastian were sending each other explicit jokes, and it was unclear that when Sebastian decided the flirtation had gone too far if he’d told Moria to stop. C-Red determined that Moria had violated the company’s policies. As a result, C-Red disciplined her and had her undergo additional diversity training. Then C-Red made a huge mistake. It it didn’t close the loop and let Sebastian know what action it had taken. In other words, Sebastian wasn’t told Moria had been disciplined and all supervisory employers were retrained on diversity issues. C-Red was concerned about maintaining confidentiality, in part to protect the parties’ reputations and reduce the risk of a later retaliation claim. How did a lack of transparency negatively affect the company or employees? C-Red’s lack of transparency, regardless of how well-meaning, caused it significant problems. Even though Moria’s conduct stopped, Sebastian resigned because he didn’t feel like the complaint had been acknowledged. Worse, he then sued the company for discrimination, and retaliation because he didn’t know the company had acted on his complaint. Not only had C-Red lost a valuable team member, but now it was looking at huge legal bills and distractions from its business. What can your organization do to keep need-to-know employees in the loop when a discrimination complaint is received? Balancing transparency and confidentiality in the workplace is difficult, especially when discrimination and harassment complaints are involved. We recommend that companies have a designated employee responsible for communications who closely monitors who “needs to know” information, and what and how information is disseminated. How employees are kept in the loop depends on the sensitivity of the information. For example, promotions can be announced company-wide via email blasts, while the results of a discrimination claim should be delivered one-on-one to the parties directly involved. 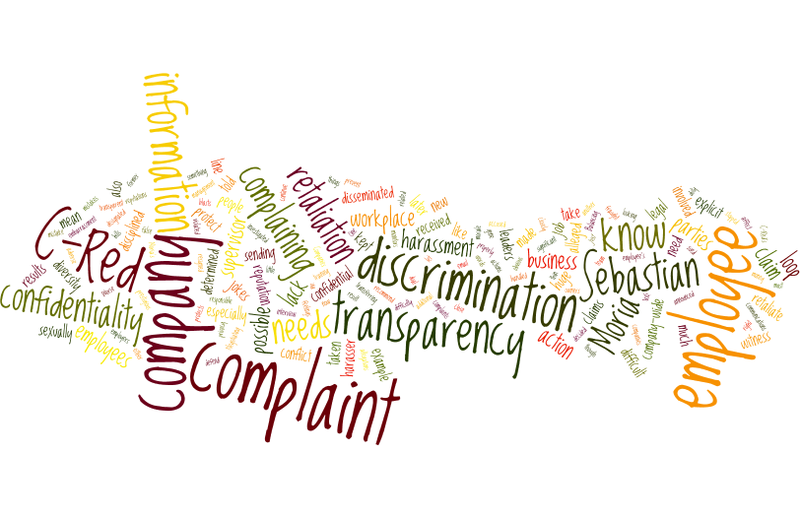 In the context of discrimination claims, company-wide transparency is likely harmful. The company has a duty to protect a complaining employee from retaliation. The more people who know about the complaint the harder it is to prevent retaliation or defend against a later retaliation claim. Companies and business leaders continue to make mistakes in transparency, especially when disclosure may conflict with confidentiality. The line between too much information and too little is thin and fraught with difficulty. Errors can be costly in terms of loss of morale, talent, time and money. You knew one was coming, right? After all, I am an attorney. Nothing in this article is or should be considered legal advice. This article is for information purposes only. This article forms no lawyer-client relationship. Consult an attorney about your situation. WE SPECIFICALLY DISCLAIM ANY REPRESENTATIONS OR WARRANTIES, EXPRESS OR IMPLIED, INCLUDING, WITHOUT LIMITATION, ANY REPRESENTATIONS OR WARRANTIES OF MERCHANTABILITY OR FITNESS FOR A PARTICULAR PURPOSE. We do not give tax or investment advice or advocate the purchase or sale of any security or investment. Always seek the assistance of a professional for tax, legal and investment advice.